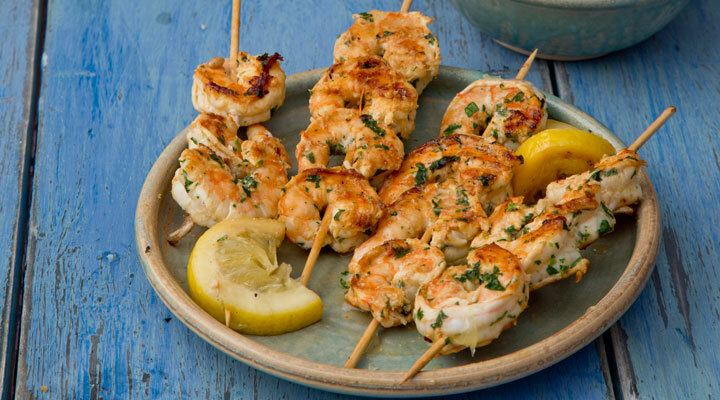 A squeeze of lemon over the prawns just before serving adds a zing of flavour and means you don’t need to add salt. If using wooden skewers, soak four of them in cold water for at least 1 hour. Whisk together the oil and lemon juice in a large bowl and season with salt and pepper. Add the prawns and turn to coat. Marinate for 15 minutes only. Thread four prawns onto each soaked skewer. Cook on the hot barbecue for 4 minutes on each side. Cut the baguette into slices on the diagonal. Drizzle with olive oil and rub the garlic clove on both sides. Cook the bread on the hot barbecue for 2 minutes on each side. Scatter the parsley over the skewers and serve the garlic bread on the side.